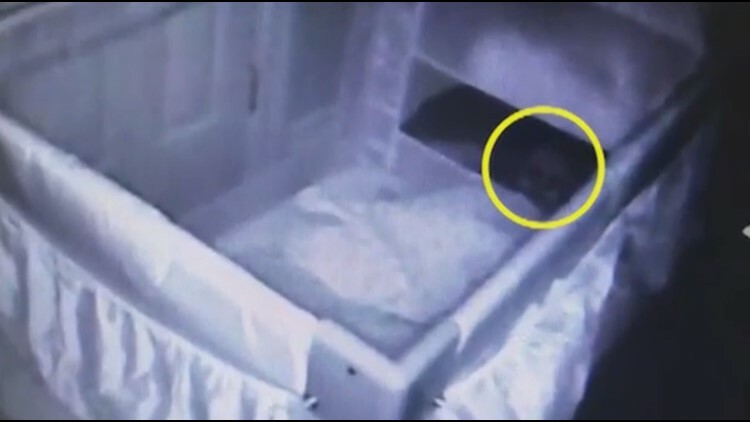 A ghostly face is seen while a baby sleeps in its crib. The mother believes it's the child she miscarried. Melissa Smith, a mother of two, is convinced she's captured footage of a "ghostly face" on her crib cam following a number of creepy occurrences, according to Caters. (INSIDE EDITION) -- A Toronto woman believes she's being haunted by the ghost of the baby she miscarried. Smith insists she was always a paranormal skeptic. But that changed in September 2016, when she believes her tumultuous miscarriage prompted a series of haunting events. The same night she lost her child, Melissa claims a children’s toy randomly turned itself on in the middle of the living room and began playing music — and things continued to get stranger from there. On May 31, Melissa said she received the most "conclusive proof" yet that her house is being haunted by her unborn baby. After she turned on her daughter Leah’s "baby cam" and saw what she believes was the face of a ghost staring at her 8-month-old. Melissa ran upstairs to pull her daughter away from the pale figure and has been dumbfounded by the footage ever since, she said. “The same night the video was taken, I was responding to some of my friends messages about it, when the lamp cord on my bedside started to move — I've heard the same noise once before," Melissa, who is going by a pseudonym, told Caters. Melissa also claims the ghost was making mischief in the kitchen a week earlier. "My husband and I were in the living room when we heard something drop into the empty kitchen sink," she said. “It was the lid of our son's sippy cup and my husband had previously placed it about a foot away from the sink — it made a very loud noise like it had been thrown." Despite her longing to remain in the world of hard science and provable facts, Melissa said she's now just seen too much. “I was a skeptic for the longest time, but after witnessing what I have, I have no choice to believe that my house has a ghost," she said.